Albert van der Sel : function analysis. In the series: Note 6. Subject: How to "analyze" a function (intersections x and y axes, minima/maxima etc..). This note: Note 6: How to "analyze" (or investigate) a function? Please be sure that you are on a "level" at least equivalent to the contents up to, and including, note 5.
to have read the former notes first. with the x- and y axis, and that sort of material. Finding the intersection with the y-axis. Finding the intersection with the x-axis. namely, the "top" of the "nose". and our well-known parabola (a quadratic function) does not have it either. However, a function like f(x)=1/x does have it. Identify all regions (along the x-axis) where a function exposes a 'climbing' character, and where it 'descends'. Alright, this is not a full listing, and not all Highschools in all countries use exactly the same "view" on the matter. However, I will stick to the above (using the above points, except 5), and let's see how it works out for two nice examples. Our first example function, will be f(x)=x3 - 4x. the crest near x=1? Those are the maximum and minimum we are looking for. 1.1 Intersection of f(x) with the y-axis. This one is really easy. Where f(x) intersects with the y-axis, it must hold that "x=0". y=f(x)=x3 - 4x. So, if we fill in x=0, then it follows that y=0. Thus, for x=0 and y=0, the function intersects with the y-axis. It's the point (0,0) in the XY plane. 1.2 Intersection of f(x) with the x-axis. Where f(x) intersects with the x-axis, it must hold that "y=0". We have found the following x: x = 0, x = -2, and x = 2, for which it is true that y = 0. So, at the following points in the XY plane, f(x) intersects the x-axis: (-2,0), (0,0), and (2,0). Check the plot in figure 1, if this is indeed correct. 1.3 Finding the local minima and maxima of f(x) (if they exist). Here is where we use the theory of note 5: the derivative of a function. 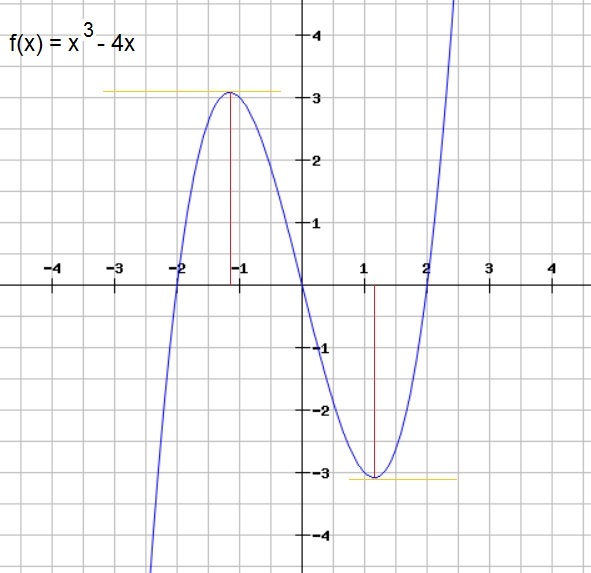 In note 5, we have found that the derivative of a function describes the "gradient" (or slope), of a tangent line. At a maximum or minimum of the function, we have exactly the condition that the gradient is '0'. Indeed, at those points the tangent line is parallel to the x-axis, with 0 slope. where the gradient is exactly '0'. So, we need to determine the derivative of the function, and find where it is '0'. x=√ 4/3 or x= -√ 4/3. So, we have found the following x's: x=√ 4/3 and -√ 4/3 for which a maximum or minimum exists. Now, these answer usually suffice. However, a teacher may request that you further calculate these square roots. Check in figure 1, if this is really correct. then for each of these two x's, we need to calculate f(x). I personally would feed in x=√ 4/3 and -√ 4/3 into that equation. I don't request to calculate it. I only want that you followed the reasoning sofar. you might say that for x = 1.15, we find that "y" is about -3.07, and for x = -1.15, we find that "y" is about +3.07. Now, check the plot in figure 1, if this is a "reasonable" approximation. But which point is the maximum, and which is the minimum? True, we have not answered this one. to determine which is the local maximum, and which is the local minimum. However, for now, if you followed the reasoning sofar, it's good enough for me. 1.4 Determining if f(x) exhibits asymptotic behaviour. If you look at figure 1, and look at some larger values of "x", you see that f(x) is climbing steeper and steeper. But is that asymptotic behaviour? No. You can keep calculating a valid "y", for any increasing value of "x". True, the figure might suggest, that ultimately, it goes insanely fast upwards. 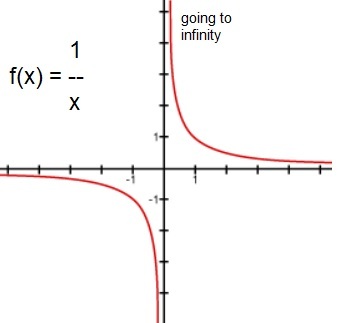 Yes but you still can calculate an "y"
A vertical asymptote, is when you let x go near a value of x=a, where the function then really "threatens" to go to +/- infinity. So, if we see a "singularity", or an "undefined territory" we might have asymptotic behaviour. A good example is the function f(x)=1/x. See figure 2 below. Figure 2. True asymptotic behaviour of f(x) when x nears '0'. 1.5 Ranges of x, for which f(x) is positive and negative. The examples below use, for example, '0' and '2' as some "markerpoint", but it can ofcourse be any number. which can be of great help to "label" certain ranges. where f(x) is positive (y>0), or where f(x) is negative (y<0). If you like, refer to figure 1 again. for x<-2, then f(x) is negative. for -2 < x < 0, then f(x) is positive. for 0 < x < 2, then f(x) is negative. for x>2, then f(x) is positive. This one is actually simpler than example 1. Here we are going to investigate a simple quadratic function. Suppose we have the function f(x)=x2 - 9x + 18. 2.1 Intersection of f(x) with the y-axis. Then we must have x=0, thus if we fill in '0' into the equation we find y=f(x)=18. So, when x=0, we have y=18, where f(x) intersects the y-axis. It's the point (0,18) in the XY plane. 2.2 Intersection of f(x) with the x-axis. You certainly may use those formula's to find both intersections. However, I "see" that "x2 - 9x + 18" can be quickly factored in (x-3)(x-6). So, at x=3 and x=6, the function intersects with the x-axis. These are the points (3,0) and (6,0) in the XY plane. 2.3 Finding the local minima and maxima of f(x) (if they exist). having "x2" has it's "nose" pointed downwards, so that's a minimum. Also, a quadratic equation having "- x2", has it's "nose" pointed upwards, so that's a maximum. Thus we have the minimum at x=4.5. To find the corresponding y value: f(4.5)= 4.52 - 9x4.5 + 18 = 20.25 - 40.5 + 18 = -2.25. So, at the point (4.5, -2.25) in the XY plane, the function has it's minimum. 2.4 Determining if f(x) exhibits asymptotic behaviour. This one is for you. Do you think f(x) exhibits asymptotic behaviour? The next note (note 7) is a super quick intro in the ex and ln(x) functions.